This would probably be my Hello World app for Windows, so don't expect something extraordinary. Well, this will be a evolutionary project, in the sense that I'll start as a Console App and develop it into a Win32 log-in complete with eye-candy and whatever bells and whistles I would be able to do. fixed number of retries or shutdown/reboot pc. I could also consider making the program rename RP9's task manager to prevent Explorer launch via Run, so that people won't be able to bypass login. Its definitely not as good as winlogon.exe, but I think its better than the stock login, which you can bypass through cancel. I'll start working on a raw sketch, test it and keep you up-to-date with what I've done. In the meantime, comments, suggestions, anything is welcomed ! The use of "Cancel" to bypass the login screen can be prevented with a registry entry that requires users to be validated. Registry files to turn this feature on and off and a text file that expands on this protection are contained in the Must Be Validated zip from Doug Knox's site. It works quite well. Well then, I guess my idea's kind of useless. I should find something else to do then. How about a animated aurora for Active Desktop (sure, no coding, just photoshop) ? 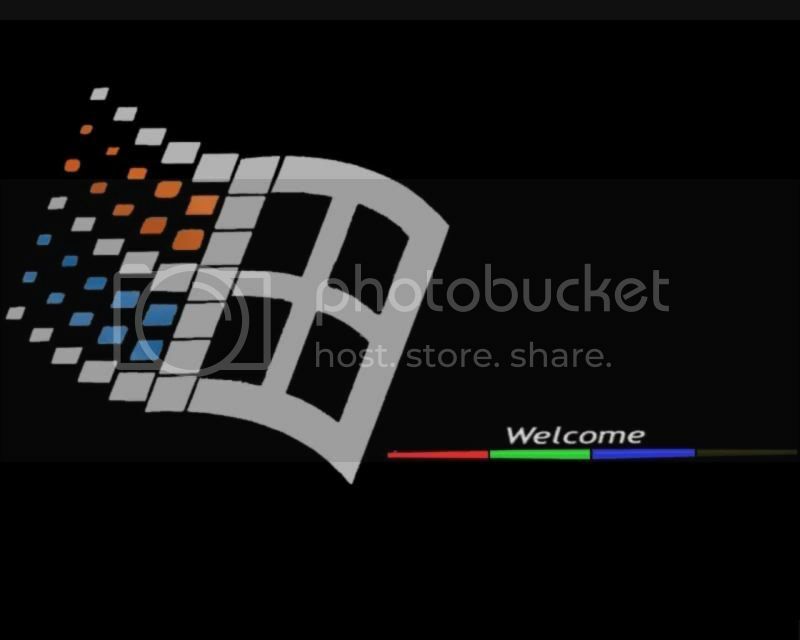 I made a Welcome animation for windows that runs before Explorer, to give it some eyecandy. The first copy line inserts the original file with "Shell=Explorer.exe" in order to launch the Shell instance of Explorer and the last copy line inserts the modified system.ini with Shell=welcome.bat, in order for the welcome video to appear on the next boot. If anyone wants the welcome video I made, do tell. I'll try to make a higher res one because the current one looks kinda ugly when launched by mplayer in WinMe. "If anyone wants the welcome video I made, do tell. I'll try to make a higher res one because the current one looks kinda ugly when launched by mplayer in WinMe." PS: I'd attach the files if archives would be permitted. Anyway, PM me for the files. until I find a file host and post a upload link. Yeah until you navigate to safe-mode and delete the registry key. Then what? This prevents booting to safe mode by using the CTRL or F8 key. The text file contained in mustbevalidated.zip explains this and much more, such as changing the boot order at the BIOS and protecting it with a password. This will prevent its being bypassed with a bootdisk or live CD. If all the steps it mentions are properly implemented, it would require opening the case and pulling the battery to defeat it. The included text file is worth reading even if you don't plan on using the registry files. Like XP, 98 is not at all secure out of the box, and like XP, a few small changes can make a big difference. Why is it when you use clients for microsoft networks it ask for a domain? It shouldn't, not by default unless you've set a domain in client for Microsoft networks. But i didn't i just followed the instructions and it ask for a domain. This is why I always change my network to Windows Logon, it seems to make it bypass this step for me. I used to get annoyed with Windows asking me for a domain and a password everytime. I love this idea you came up with!